The Democratic Republic of Congo's parliament speaker has quit after criticising the decision to let Rwandan troops enter the country in January. Vital Kamerhe had said the president should not have allowed them in for a joint operation against rebels. 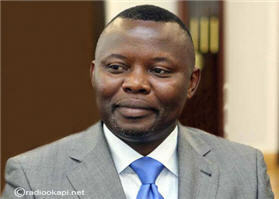 Mr Kamere was under pressure from his own party, the People's Party for Reconstruction and Democracy, which is also President Joseph Kabila's party. The speaker was reportedly applauded as he announced he would stand down. "Please accept my resignation without debate or vote," Mr Kamerhe told the national assembly, according to AFP news agency. Thousands of Rwandan soldiers were invited into eastern DR Congo for several weeks this year to help tackle rival militias plaguing the border between the two neighbours. The joint operation was politically sensitive as Rwanda has twice invaded the country in recent years and some Congolese were distrustful of the Kigali forces presence.